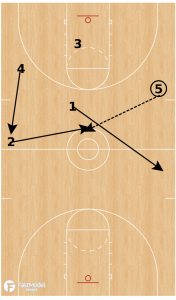 This press attack was contributed to the FastModel Sports Basketball Plays and Drills Library by Rory Hamilton of Norman North High School. This is what Coach Hamilton had to say about the press attack. Press Break Alignment is with 3 man taking ball out-of-bounds and the 1 and 2 are at the elbows. The post players 4 and 5 are at half court. 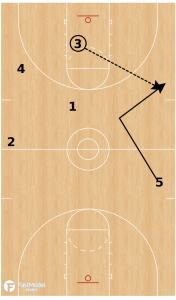 We use 4-up press break vs. any on the ball zone presses (1-2-2, 1-2-1-1, etc). It starts with our ball side post flashing to the FT line extended to receive a pass. On the catch, our point guard 1 screens away for the 2. 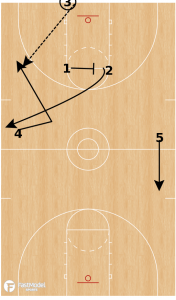 After screening for the 2 the 1 sits in the middle of the floor and the inbounder steps in for ball reversal. Again the concepts are the same as we look to attack sideline, middle, and a throw over. 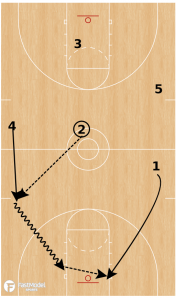 On ball reversal back to the inbounder our press break slides are : middle flashes sideline and the sideline flashes middle. The 4 man sprints wide and looks to space the floor and be a deep threat. If the ball is passed middle, the receiver immediately looks to pass it opposite for a potential (2 vs. 1) against the defense. Press Break Alignment is with 3 man taking ball out of bounds and the 1 and 2 are al the elbows. The post players 4 and 5 are at half court. We use 4-up press break vs. any “on the ball” zone presses (1-2-2, 1-2-1-1, etc). It starts with our ball side post flashing to the FT line extended to receive a pass. On the catch, our point guard 1 screens away for the 2. 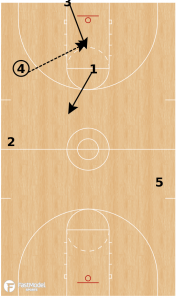 After screening for the 2 the 1 sits in the middle of the floor and the inbounder steps in for ball reversal. Again the concepts are the same as we look to attack sideline, middle, and a throw over. Ball is reversed back to the inbounder. Middle flashes sideline and the sideline flashes middle. The 4 man sprints wide and looks to space the floor and be a deep threat.